During the period 1998-2006 scientists at the CSIRO Centre for Environmental Contaminants Research (CECR) played a pivotal role in developing a sound basis for the assessment and regulation of contaminated sediments in Australia, and at the same time influencing international practices in this area. They developed protocols for the assessment of contaminated sediments, established the pathways by which different organisms take up contaminants and drafted sediment quality guidelines to enable the delineation between sediments that cause adverse biological effects and those that do not. The research is already affecting the way consultants in Australia undertake sediment quality assessments, and this is being accepted by the regulatory agencies. CECR has provided ongoing sediment assessment advice to consultants and regulators in New South Wales, Victoria, South Australia, Western Australia, Tasmania and Queensland. Their findings are guiding responsible management of contaminated sediments, while providing a sound basis for the protection of uncontaminated sediments. This approach once fully documented in guideline document revisions will lead to improvement in the management of water and water-dependent ecosystems in Australia, by protecting both benthic and overlying water ecosystems from the impacts of sediment contaminants. The results will be applicable to all areas of the Australian environment, although initially being focused on estuarine water bodies, where most of Australia’s sediment contaminant issues reside. Sediments are often overlooked, but are important as food sources and breeding grounds for aquatic organisms. These functions are under threat since sediments are also the ultimate repository of most water-borne contaminants. While water quality is effectively regulated in Australia and New Zealand, prior to 2000 there was no available guidance to industry or regulators on how to assess the impacts of contaminated sediments. CSIRO undertook the lead role in writing this document and establishing interim sediment quality guidelines for a range of sediment contaminants. At the time it was recognised that much more was required to underpin these guidelines to be confident that sediment-dwelling organisms and organisms in the overlying water in our harbours, estuaries and rivers were being protected. When the interim guidelines were released in 2002, their application was limited because there were no appropriate bioassays that could be applied and the protocols for sample collection, handling and manipulations were not sufficiently robust to avoid spurious results. Thus there was a need for research to advance the guidelines from their interim status. The research activities to be described here involved collaboration with Dr Ross Hyne and Dr Tony Roach (NSW Department of Environment and Conservation), Professor Bill Maher (University of Canberra), Dr Dianne Jolley (University of Wollongong) and Dr Peter Teasdale (Griffith University ‘ Gold Coast). The research has been supported by grants from the NSW Environmental Trust and more recently by Rio Tinto, BHP Billiton and Xstrata Copper. In the absence of readily applicable and sensitive whole sediment bioassays using Australian species, the CSIRO team led by Graeme Batley, Stuart Simpson and Jenny Stauber screened a wide range of potential test organisms. They developed three new acute bioassays using respectively, a sensitive benthic algae, Entomoneis cf. punctulata, (the first such bioassay reported internationally), an estuarine amphipod, Melita plumulosa, and a shellfish, Tellina deltoidalis. These species were the most sensitive to metals of a range of species tested. Particularly novel was the use of a benthic alga, with flow cytometry being used to detect an enzyme response in the presence of sediment particles. This assay could generate results within 24 hours. The toxicity tests, once fully developed, are handed over to commercial ecotoxicology laboratories for routine application. Ongoing research is developing more sensitive sub-lethal bioassays using species with different feeding strategies and burrowing behaviour (e.g. harpacticoid copepods, polychaete worms and snails) to further improve the versatility and robustness of existing methods. The effects of poor sediment sample collection and handling procedures on test outcomes are poorly described in assessment protocols. The CSIRO research demonstrated that inadequate handling, storage and manipulations during testing procedures could lead to changes in sediment chemistry, that affect the bioavailability and toxicity of sediments, e.g. the oxidation of iron (II) and associated decreases in porewater pH, may increase metal concentrations in the pore water and increase toxicity. Artificially contaminated (spiked) sediments are often used to determine toxicity thresholds for organisms to specific contaminants. The team demonstrated that improper preparation of such sediments causes toxicity to be grossly overestimated and such errors have confounded some published research findings. Based on their findings, protocols were documented that would minimise such changes and definitive recommendations on sediment handling and manipulation techniques were published to ensure that the chemistry was consistent with naturally contaminated sediments. Pore water (the water between sediment particles) has traditionally been viewed as the major contaminant uptake pathway. Pore water concentrations of metals, even in contaminated sediments, can be quite low and are only exacerbated by poor handling. Uptake via sediment ingestion may be a dominant pathway for some organisms. Using state-of-the-art radiotracer uptake techniques, the CSIRO researchers demonstrated that, for an estuarine amphipod and bivalve, metals such as copper and cadmium could indeed be accumulated from both sediments and waters; including pore water, burrow water and overlying water. Such sediments could be a major source of contaminants, so incorporation of this pathway in sediment guideline derivation, was the next issue tackled. Sediment quality guidelines (SQGs) are intended to delineate between sediments that cause adverse biological effects and those that do not. However, CECR showed that toxicity was not observed in sediments with metal concentrations many times greater than the interim SQGs used in Australia. This is not a major issue in the Australian Guidelines since these are used as screening tools with exceedence triggering further action, but has highlighted a need to develop new and more appropriate guidelines. the effects of sediment grain size and binding phases on contaminant partitioning and exposure pathways. CSIRO developed a new model for deriving sediment quality guidelines that takes these factors into account. It uses the concept of a lethal exposure concentration that is independent of uptake pathway. Using this approach, site-specific sediment quality guidelines for specific contaminants can be derived. These guidelines are applicable to the particular grain size and organic carbon content, features that control sediment pore water partitioning of contaminants. This theory has been applied to the development of a more appropriate sediment quality guideline for copper. Following its role in developing Australia’s interim sediment quality guidelines, CSIRO’s research has significantly advanced the science underpinning sediment quality assessment to the point that new and more defensible frameworks, based on the weight of evidence from multiple lines of information, are being provided for the management of natural water systems in Australia. In so doing, it is currently refining the methodology for ecological assessment from the accepted (and expensive) statistically rigorous approach to a simplified approach that can be appropriately evaluated with other lines of evidence. In the revised framework, contaminant bioaccumulation and bio-magnification are more explicitly addressed. The expanded framework addresses the use of biomarkers and surrogate methods for assessing contaminant bioavailability (to replace more time consuming and expensive methods) as lines of evidence. The outcome is a more transparent and defensible approach to sediment quality assessment. These findings will be incorporated in new Guideline revisions as well as in the current revision of the National Ocean Disposal Guidelines for Dredged Material. The CSIRO group is frequently requested to provide guidance to regulators and industries on emerging contamination issues. Site-specific assessment issues require the rapid generation of new techniques and knowledge and often impedes decision making by regulators. CSIRO research has had direct application to the assessment of contaminated sediments and their subsequent management in Newcastle Harbour, Sydney Harbour, Port Kembla, Gunnamatta Bay, and Shellharbour (NSW), Moreton Bay, Townsville Harbour and Port Curtis (Qld), Port of Melbourne (Vic), and Cockburn Sound (WA). Decisions based on these assessments will involve remediation that appropriately protects aquatic and benthic ecosystems. CSIRO investigated the likely impacts of acidic, metal-contaminated groundwater from remediated industrial sites on Sydney Harbour, finding that impacted hot-spots would occur in sandy sediments. Capping of contaminated sediments with sand, and occasionally more expensive zeolite materials, is often proposed as a remediation option for severely contaminated sites. CSIRO demonstrated that natural silty sediments are more suitable as capping materials than sand or zeolites, as they effectively prevent contaminant fluxes and provide an adequate substrate for recolonising biota. The Centre for Environmental Contaminants Research has promoted its research on procedures for the assessment and regulation of contaminated sediments at specialist workshops in Sydney, Melbourne, Brisbane, Adelaide and Christchurch, at national and international meetings and in some 33 journal publications in the period 2001-2006 including co-editing of the international (SETAC) publication ‘Use of Sediment Quality Guidelines and Related Tools for the Assessment of Contaminated Sediments’. 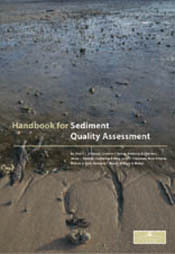 To overcome the need for better assessment guidance from environmental consultants, industry and water regulators, CECR produced a Handbook of Sediment Quality Assessment in 2005, that incorporated their research innovations and the latest state-of-the-science in an informative Australian guidance document. This has so far been downloaded from its website over 25 000 times. CECR has provided ongoing sediment assessment advice to consultants and regulators in NSW, VIC, SA, WA, TAS and QLD.